Waiting on Wednesday is a weekly meme hosted by Breaking the Spine, that spotlights upcoming releases we can't wait to read. 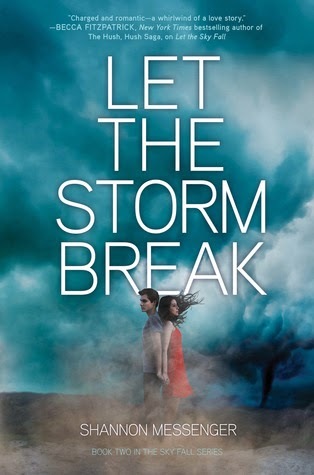 My pick is Let the Storm Break by Shannon Messenger! Gah, these covers. Why are they so gorgeous? I sincerely hope that the publishing company doesn't decide to change the cover design for the last book. They're perfect just the way they are. Anyway, my best friend and I are practically counting the days till this comes out. I convinced her to read Let the Sky Fall and, like me, she completely loved it. I can't wait to find out what happens in this sequel! That cover is beautiful--love the blue! I have the first one on my TBR list--which I am hoping to tackle this year better than I did last year. :) My WoW Happy Reading! Really need to read the first one!! Great pick :) Thanks for stopping by. I haven't read the 1st book yet but I've heard really good things about it. I hope you enjoy it once it comes out.